Whoopi Goldberg is an American actress, comedienne and media personality. Her first film debut was commemorated with a Golden Globe Award and since then Whoopi has blazed trails through the movie industry. She’s most noted for movie sensations which have become classics. The Color Purple released in 1985 was nominated at the Academy Awards eleven times. In 1990 Whoopi starred in the Romantic comedy Ghost, along with Patrick Swayze and Demi Moore. Her performance won her a second Golden Globe and an Academy Award for Best Supporting Actress. Whoopi’s achievements include thirteen Emmy nominations, winner of Emmy, Academy and Tony awards, British Academy Film award and four People’s Choice awards. She also holds a star on the Hollywood Walk of Fame and became the first African-American female to host the Academy Awards in 1994 and again in 1996, 1999, and 2002. Whoopi Goldberg was born as Caryn Elaine Johnson in New York City and raised in Manhattan’s Chelsea neighborhood by her parents Emma (née Harris) and Robert James Johnson. Her mother eventually raised her and her brother alone when Whoopi’s father abandoned the family. 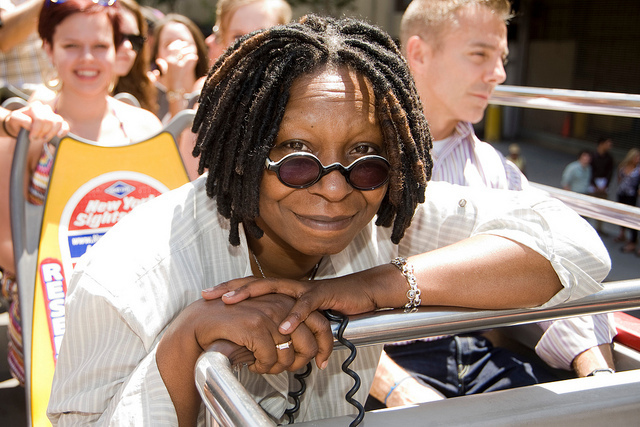 Her stage name Goldberg was derived from Jewish actors whilst the Whoopi came from “whoopee cushion”. At age eight Whoopi performed with the Helena Rubinstein Children’s Theatre at the Hudson Guild; she dropped out of high school at age fourteen and began working as a counselor at a summer camp. She was married at age eighteen and had her daughter Alexandrea. In 1975 Whoopi found the San Diego Repertory Theatre and joined the improvisational theater group Spontaneous Combustion. She later joined the Blake Street Hawkeyes and worked as a stand-up comedian. Whoopi made her on-screen debut in the 1981-82 ultramodern film I’m Not Losing My Mind, I’m Giving It Away. She went on to create The Spook Show in 1983 which was later taken to Broadway. The self-titled show ran from 1984 to1985 for a total of 156 sold-out performances and brought critical attention. Whoopi’s Broadway spotlight led her to the film The Color Purple made off the Pulitzer Prize novel with the same name; she was offered the lead role by director Steven Spielberg. The film was released in late 1985, and was both a critical and commercial success. It was later nominated for 11 Academy Awards including a nomination for Whoopi as Best Actress which she won. Whoopi’s next endeavor was the 1986 comedy-thriller Jumpin’ Jack Flash which was a success. Her choice of successful movies was short-lived however as she took on roles in the films Burglar, Fatal Beauty, and The Telephone, though she still garnered awards from the NAACP Image Awards. In 1988 Whoopi was featured in the critically acclaimed movie Clara’s Heart; she ended the 80s with appearances in HBO specials of Comic Relief. In January 1990, Whoopi starred in the CBS comedy Bagdad Cafe. Her next Academy award performance came with the 1990 film Ghost; Whoopi became the first black female to win the Academy Award for Best Supporting Actress in almost five decades. Whoopi made guest appearances on Star Trek: The Next Generation and in May 1992 she struck again with the box-office smash Sister Act. The motion pictured grossed well over US$100 million and Whoopi was nominated for a Golden Globe.